MIAMI – The Coast Guard modified the Port of Miami Anchorage Area July 19 by dividing it into two areas, the inner-western anchorage and the outer-eastern anchorage. 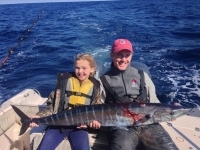 The modification was a result of collaboration between numerous stakeholder groups, federal, state and local agencies, and private citizens, and was facilitated by the Florida Department of Environmental Protection. The new anchorages, combined, total approximately 2 square miles, which is a reduction of about 3 square miles. The division will result in saving more than 600 acres of coral reef from future impacts while decreasing shipping hazards. This action was deemed necessary to reduce damage to the ecologically and economically important northern portion of the Florida Reef Tract. 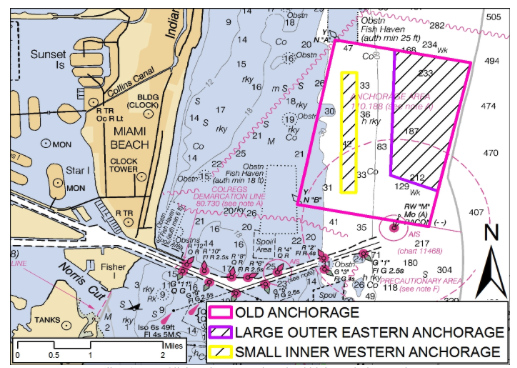 Buoys currently marking the western boundary of the old anchorage will be removed and nautical charts of the area will be updated with the new boundary lines. For more information, contact Mr. Paul Lehmann with the 7th District prevention waterways management division at 305-415-6796 or paul.d.lehmann@uscg.mil.